It comes a time in a persons life when one must stop and remember. Remembering is important and that is a lesson that I learned from Cecil. Cecil Murphy died in June 2006 in Alberta Canada. As one goes through life we meet friends and family. My wife is from a large one. Well of all the family, we get close to some and not-so-close to others. Maybe this is because of time, and most likely distance. Personalities bond better with some that others. Well, frankly, I've truly felt a kinship and closeness to Cecil and his most creative wife Helen. They both have a great sense of humor and used it to pass on their exuberance to others. Cecil would take the time to look at pictures. He would look at anyone's pictures carefully. He seemed to be taking in the feeling, the ambiance, the history, the heritage of each picture. He also did that in life. He seemed to have the ability to take you into his life. Certainly, they both made us feel so very welcome. They put up with us, they listened, shared and enjoyed us. So a lot of thanks goes to Helen and Cec for their many years of love and kindness to all who darkened their door of life. Especially to us. Cec and Helen came to visit us and our home sparkles with the many creations that Helen made for us. Cec has always been a kind man around me, loving to his kids and grand children. You could see it in his every action. He was also a man of God. What a love. Cec and Helen were the ones that gave up their home just so Betty and I could host a Murphy reunion. What love ! It was fun and we enjoyed doing it and would do it again if given the opportunity. 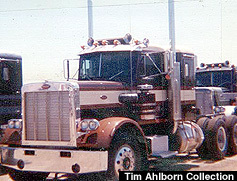 Cec would stop by Wheatland sometimes when he was trucking through to someplace in southern US. We had some great visits. So I just wanted to put in print my appreciation for Cecil and Helen and pay the proper tribute and respect to a great brother-in-law and a friend. I loved Cec and Love Helen. Because of Cec life took on a greater meaning, and I loved him and remember him because he was my friend. It's hard to write a poem about someone you love when it's really more than one. That other one is Helen who was such a part of the family team. So my first poem includes them both. A team. Then I sat here at the computer thinking about another peom so with the quill of the keyboard I wrote one more. To Cecil who drove the Diesel. He put his arms around you Cec, and lifted you to rest. Cec, you live on through your children, you're always by our side.